Okay, so maybe that warning label isn’t on the front cover of the creepy new thriller by Patricia Snodgrass. But it should be. 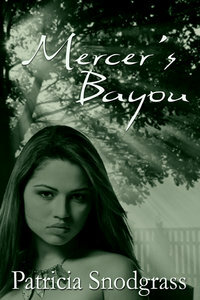 Mercer’s Bayou grabs readers from the get-go, sucking them under, only rarely allowing them to come up for a gasp of air. Lost and grieving after the vicious murders of his wife and daughter, Pastor James Thomas accepts an invitation to move to Mercer’s Bayou and become pastor of a small church on the outskirts of town. From the moment he moves into the small trailer nestled next to the church, strange and horrifying things start to happen. First, a garbage collector gets sucked into his truck and is crushed to death. A dead tree situated next to the cemetery emits an eerie, bioluminescent glow. Ghosts float in and out of a strange fog—including the ghost of his deceased wife. Also new to the bayou are Megan and Brody Wallace. They, too, are spooked by the disturbing events taking place. A strange pendant keeps appearing in Megan’s pocket, her hand, around her neck—no matter how often she throws it away. Brody turns into a human robot not unlike the Stepford wives, and suddenly is overwhelmed with the urge to kill his wife. As word spreads of an old-fashioned revival at the church on the Bayou, more and more people fall under the spell affecting Brody and Pastor Thomas. People not influenced flee the town in terror. What happens at the revival will both shock and frighten the reader while s/he has such a tight grip that the book is impossible to put down. I admit, I don’t read a lot of horror. I used to a long time ago, when Stephen King was writing books like Salem’s Lot and Pet Cemetery. But I lost my appetite for such books around the time of my thirtieth birthday. King had lost his edge, in my opinion, and no one else’s horror was nearly as appealing. That is, until Mercer’s Bayou came along. Fans of King’s early work will love this book. Snodgrass deftly builds tension while cutting away at just the right moment, allowing the reader’s imagination to figure out exactly what has happened to the people dying in freak accidents as the story unfolds. Her characters are well-rounded, believable people, people the reader will care about, even when under the mysterious spell. Megan Wallace is a perfect heroine precisely because she is so human. An unlikely hero is always the most intriguing. Mercer’s Bayou is not without flaws. The e-book is fraught with typographical errors, although I am assured these will be corrected before the book comes out in print. But these errors don’t interrupt the flow of the story, and shouldn’t bother most readers. What did bother me was the way Snodgrass used the characters thoughts instead of internal narrative monologue. There are so many thoughts thrown in the story it became distracting and irritating. Thoughts are like dialogue. They should be used only to convey compelling information. Third person internal narration should be used for things characters are observing, but that aren’t necessarily that compelling. All those italics are hard to read, and when nearly half a page is written this way, it can create quite the headache. Still, even this is something that can be chalked up to the author’s relative inexperience as a novelist. The story itself is so good, once I took a couple of ibuprofen to rid myself of the eye strain-induced headache, I could forgive this chink in an otherwise well-crafted story. Smoky Trudeau is the author of three books: Redeeming Grace, The Cabin, and Front-Word, Back-Word, Insight Out: Lessons on Writing the Novel Lurking Inside You From Start to Finish. She works as a freelance writing coach and editor, book review columnist, and has taught fiction writing for many years at community colleges and other venues throughout the Midwest. Visit Smoky at www.smokytrudeau.com.